The new design theme introduced for MO here is now live. Several issues with the new theme were raised in that discussion. I'd like to discuss one of them, which is sort of buried in my answer and David Roberts' comment to the answer. In the new design, MO looks more similar to MSE than it used to. How can we change this? As David Roberts pointed out, new users already have enough difficulty understanding the difference between the two sites. Many people (like me) are frequent users of both MO and MSE, and I for one would appreciate having more visual cues to remind me which site I'm on. My general sense is that what used to distinguish MO from MSE was that MSE had the feel of a general StackExchange site with a few customizations whereas MO had a minimalist feel that somehow reflected its independent origins -- an approach that seems to be specifically ruled out in the new design theme. Therefore I think it's worth considering trying to attain some sort of altogether new look. But I'm not sure what that should be. The headers: one says "mathoverflow" while the other says "mathematics". Of course, this disappears as soon as you start scrolling down. The background: MO is plain while MSE has their graph paper theme. Once you start scrolling down, this is only visible in the far left region of the page. The "Ask Question" button: orange for MO, navy for MSE. This also disappears once you scroll down. In the tabs for which questions you want to view: "Active" for MO, "Interesting" for MSE. Disappears when you scroll down. Tags: white with an outline and black text for MO, light blue with dark blue text for MSE. Text: Blue sans serif for MO, black serif for MSE. "Hot Network Questions": not present on MO (replaced by "Recent Tags" and "Recent Badges"), present on MSE. (Not visible in these screenshots -- this is in the lower right part of the screen.) I'm very glad that this distinction is maintained from the old theme! I could go on to the interface for asking a new question or viewing an existing question, but the similarities and differences there are really of the same flavor. What used to distinguish the two sites? Well, I no longer have access to the old looks of the two sites, so I'm going by memory here. Carlo Beenakker points out that MO used to have a distinctive color scheme to distinguish questions which were unanswered / answered / answered and accepted. მამუკა ჯიბლაძე and GNiklasch point out that MO used to have a color scheme highlighting accepted answers. "Home", "Questions", etc. on the left navigation bar used to be at the top of the page, and I believe MO had a different color scheme for them than MSE did. I'm not sure, but I think these screen elements used to remain at the top when you scrolled down? I think the graph paper background on MSE used to be visible across more of the screen than it is currently (Now as soon as you scroll down, it's visible only at the far left of the screen). Overall, I think that MO used to have an "orange and green" feel whereas MSE had a "red and blue" feel. Now both of them feel mostly colorless to me. I'm not sure, but I think before the left navigation bar was there maybe MO's questions were more flush to the left than MSE's? In general, I think the old differences were quite subtle, and reflected MO's independent origins. We might consider some kind of header / background beyond the plain look we've always had. We might consider asking to re-implement some of the old color distinctions like with unanswered / answered / answered and accepted questions. It sure would be nice if more of the distinctive design elements remained visible when one scrolled down. As it is, the parts of the site which travel with you when you scroll are the black bar at the top and the left navigation column. The only customization I see in these elements is the background (graph paper for MSE) which appears on the left navigation. Maybe we should consider having the words "research mathematics" appear somewhere on the front page? As it is, I don't think it really jumps out from the main page that that's the purpose of this site. EDIT: In the interest of gauging people's interest, I'm going to start throwing some answers up here. Please upvote if you like / downvote if you don't / discuss in the comments! And of course, add more suggestions as answers! EDIT: Some more information from Catija: This screen element is not currently customizable, so if we wanted it customized, SE would have to implement a new feature. Here Catija indicates that the current SE thinking is that this particular screen element ought to be something which looks the same across the whole SE network. But here she indicates that on the timescale of a year or so, they might revisit this screen element, and either change it network-wide or make it customizable. See also Catija's latest comments over on Carlo Beenakker's original post. The vote counts / answer counts / view counts are one of the most commonly-recurring screen elements on the front page, so customizing them added a good bit to the unique feel of MO. Bringing back that old color scheme seems like a small change which could go some ways toward making MO feel more distinctive. This seems like a very generic customization that many sites could potentially be interested in using, especially in light of (2) above. This wouldn't address the feel of the pages for particular questions, but I think it would help the front page. I've posted essentially the same answer to the site-wide meta discussion. 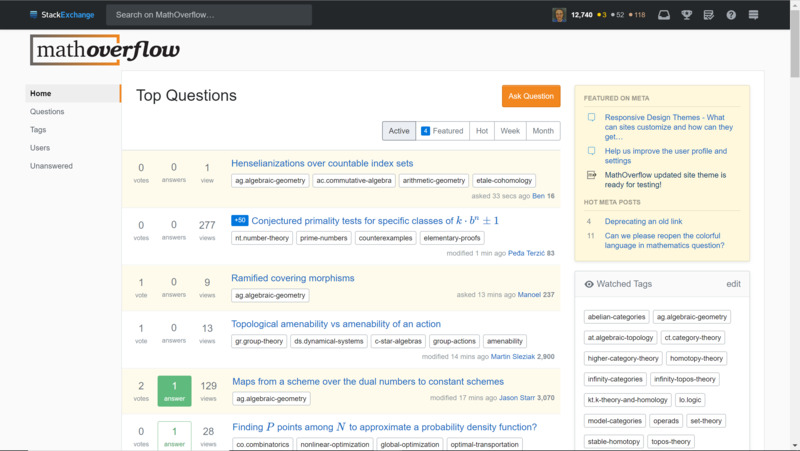 I get the sense that StackExchange would be more likely to implement something like this if we could generate interest from other sites as well. As a data point for our Stack Exchange overlords, I have twice now tried to migrate a question from math.SE to math.SE because I didn't realize it was already there. I'd really like to get a striking difference in color and background. I suggest that we leave the job to Stack Exchange's design team. I'm not sure why we are supposed to come up with a solution ourselves; we are not professionals, and surely SE has someone on staff whose job is coming up with good site designs. I like many of their designs that were on other sites in the network before this change. What worries me, though, is that everyone has been complaining about these two sites looking the same for days here and yet there does not seem to be any interest on their part on fixing it. The only message we got regarding their roadmap seems to imply that this issue isn't even on it: "We're working on accessibility concerns for the entire network but that won't really address the sites looking the same." Maybe simply changing background colors for the tags would help to made the site distinguishable from others. Perhaps this would not help too much when looking at an individual question - after you scroll down you no longer see the tags. But there are many pages with lists of question that users of the site quite often look at, on those pages the tags are displayed quite often and having differently looking tags would make differentiating between the sites easier. I would suggest some color which is not too bright - but still at least noticeable. (I'll mention that I am not very familiar with CSS, so probably somebody with better technical knowledge might have some better suggestions.) I have tried some of the colors listed here. (For visual samples of the colors used here see also: https://stackoverflow.design/product/base/colors.) The only thing I was changing was background-color. 1Emphasis mine: "Colors can be customized to a degree (and many have been adjusted through this process). 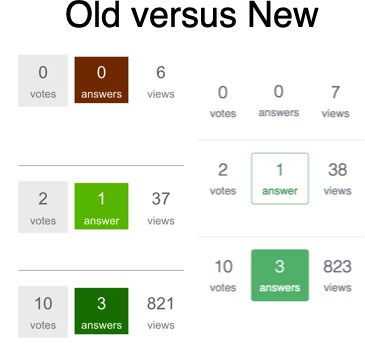 This includes buttons, OP indicator boxes, link colors (visited/unvisited), voting arrow colors, tag colors (background & text), question titles (in the questions list, not on question pages)." We could consider some kind of background theme. I think MSE's graph paper looks pretty good. Of course, the goal would be to come up with something good which contrasts to the MSE graph paper. If we did this, I imagine we'd want to solicit particular suggestions from the community and then vote on them. We could consider choosing some kind of art in the header of the page. MO has always had a "plain" sort of theme, but maybe it's time for something new. If we did this, I imagine we'd want to solicit particular suggestions from the community and then vote on it. Not the answer you're looking for? 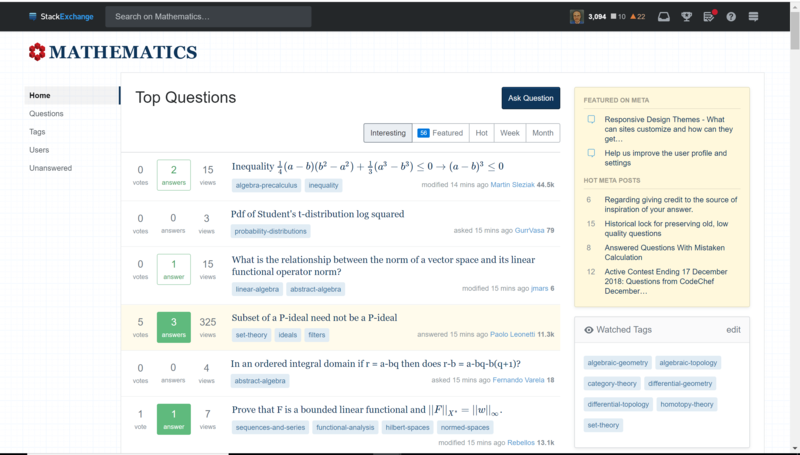 Browse other questions tagged discussion design math-stackexchange . What is the plan for the new site theme?